Mantri Developers is at it again. 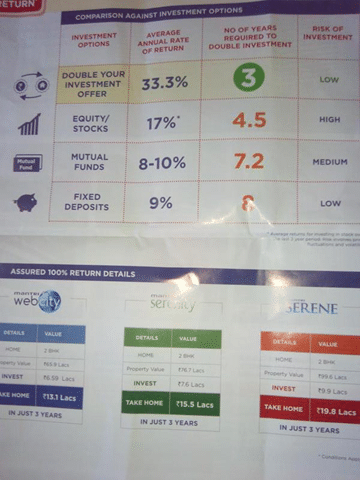 They’re offering 100% assured returns on your “investment”, and SEBI/RBI do absolutely nothing! In fact, they even compare their offered guaranteed returns to things like equities and mutual funds! Note: Someone forgot their mathematics. If you double your money in 3 years, the rate of return is 26%, not 33%. 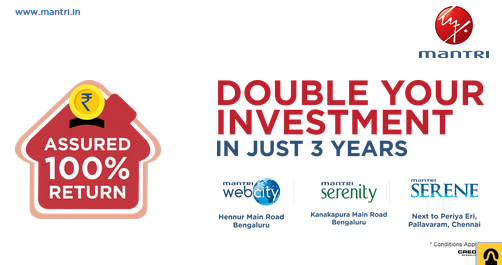 Remember, Mantri did it again last year : Guaranteeing 100% returns on a property in Bangalore. I assume this kind of thing is still on. The problem, as I stated there, is the grey area. There is unlikely to be a “guarantee” in any real sense of the word (that is, which you can take them to court for). A guaranteed return is against all principles of SEBI and RBI which will require that any such return carry all sorts of capital allocation and risk management. Plus, do you see the little *Conditions apply? That pretty much clinches it. The conditions that will apply will probably not be in your favour. If there are customers who will buy the property for 120% of the price (or more) three years later, this guarantee works. If not, then we don’t think it’s going to be easy to recover this money – and if you’re the one signing loan papers, you might just be saddled with a loan as well. We would avoid this under any circumstance. SEBI and RBI don’t allow assured returns like this unless it’s guaranteed on your balance sheet. Effectively, the 100% guarantee is, for them, another loan that is payable in the future, and should technically reflect on their balance sheet. And if they have too many such guarantees, banks should know so that they understand whether they should lend more money to such developers. But our sources say that is not really the case; such assurances are typically signed by a non-authorized person and does not reflect on the balance sheet of the company. I wonder if the government will still be a silent spectator or actually put this real estate regulator in place. It’s high time we make builders solidly accountable.